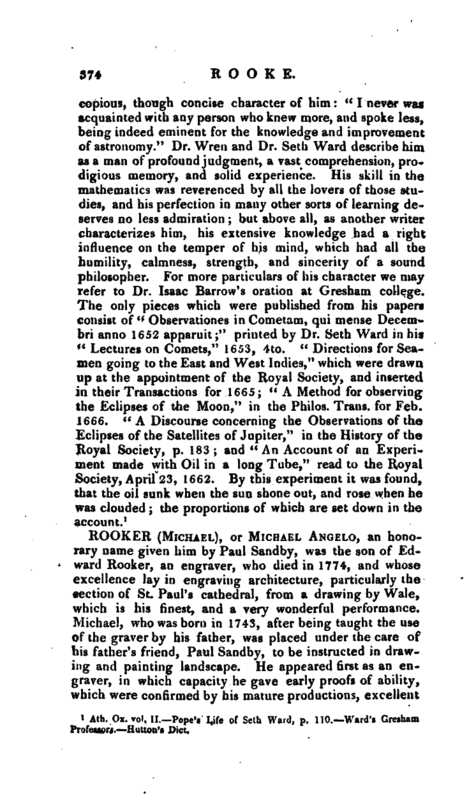 , or Michael Angelo, an honorary name given him by Paul Sandby, was the son of Edward Rooker, an engraver, who died in 1774, and whose excellence lay in engraving architecture, particularly the section of St. Paul’s cathedral, from a drawing by Wale, which is his finest, and a very wonderful performance. Michael, who was born in 1743, after being taught the use of the graver by his father, was placed under the care of his father’s friend, Paul Sandby, to be instructed in drawing and painting landscape. He appeared first as an engraver, in which capacity he gave early proofs of ability, which were confirmed by his mature productions, excellent | specimens of which may be seen in a view of Wolterton hall, Nottinghamshire, and in many other prints which he engraved. But his talents were not confined to the graver, for he also employed the pencil, and in 1772 exhibited a view of Temple Bar, as it then stood, which had considerable merit. 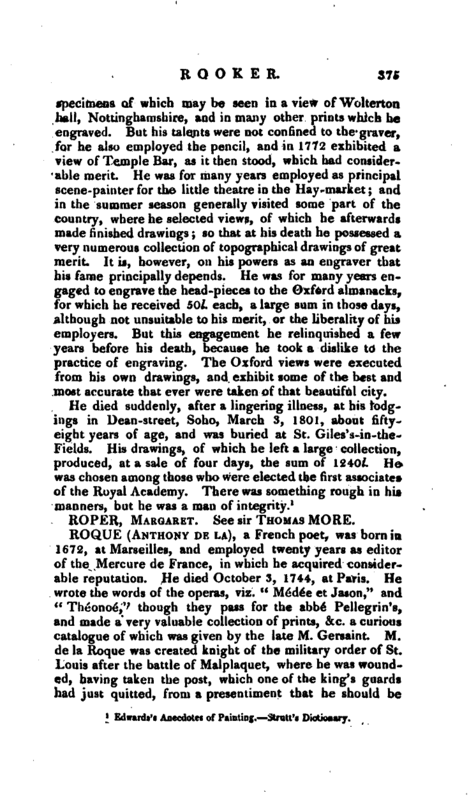 He was for many years employed as principal scenerpainter for the little theatre in the Hay-market; and in the summer season generally visited some part of the country, where he selected views, of which he afterwards made finished drawings; so that at his death he possessed a very numerous collection of topographical drawings of great merit. It is, however, on his powers as an engraver that his fame principally depends. He was for many years engaged to engrave the head-pieces to the Oxford almanacks, for which he received 50l. each, a large sum in those days,, although not unsuitable to his merit, or the liberality of his employers. But this engagement he relinquished a fevr years before his death, because he took a dislike to the practice of engraving. The Oxford views were executed from his own drawings, and exhibit some of the best and most accurate that ever were taken of that beautiful city. Edwards’s Anecdotes of Painting. Strati’s Dictionary.